This month is well on its way and I have big plans. Better share them before it’s too late and I feel like I don’t need to try to accomplish them. ♥ get back to less chocolate, cake and candy and trying to catch up on the weight thing. I am a bit disappointed with myself after such a strong start. Not happy with myself at all. ♥ Back to basics. Less candy, cake and sugar. Maybe less carbs at night. ♥ I will work on it. ♥ I planned on cleaning all the kitchen cupboards. But I am scared to actually mention it here. I am still trying to do Februar… I am just not the traditional neat housewife. I hate cleaning and tying up… What a waste of time. Well of course I didn’t start this. I have an image to keep by now… I did clean two more windows though. ♥ I admitted to myself I hate cleaning. I hate doing the work but love the result. And I hate my bitching about it and being all grumpy. So I seriously considering a maid. This I my months goal. Find cleaning aid! It started yesterday trying out one service. And when the everyday chores don’t get in the way I might actually get some deep cleaning and decluttering done. I hope all works out how I plan and we live a cleaner life with less stressing. ♥ I will bake three new cakes this month at least. So I catch up big time. I also want to get back to cooking more. Maybe I will get to it. ♥ keep reading this new book. ♥ I got a great book (The creative habit, by Twylar Tharp) for my birthday which will definitely be read this month. ♥ I can only think of one birthday… 1 card it is! Ups I missed the birthday card here but wrote three birthday invites so I figured it counts. ♥ I think it’s only hubby’s bday and I rather bake a cake than write a card. I know, I know pushing hard screwing up on goal #1. ♥ keep going and tackle this technical-blog-to-do list didn’t really find the time and mood to do so. ♥ maybe write a few more posts… who knows mhm I might have. I definitely had plans. ♥ It’s blogtacular month so it’s my ultimate blogging month. It may not show on the blog but I will meet friends, make friends, be inspired, be scared and overwhelmed, find new motivation and discover new ways. I am sure in the long run this blog will see it. ♥ Trying to put my creative energy in some home improving. I build a shelf, worked on some craft lab improvement, made some candles (post to follow), and finally used my not so new tool: the Dremel. ♥ Maybe get around to do some fabric printing or sewing?! 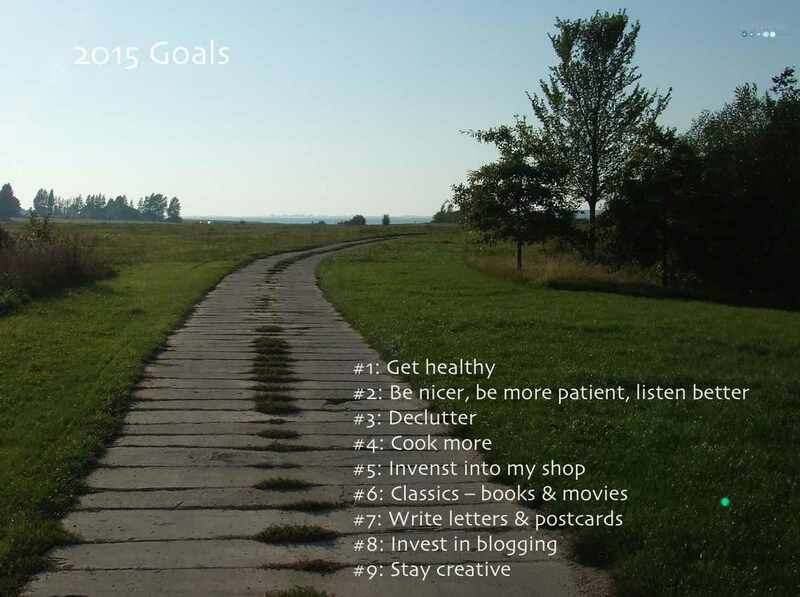 As always looking forward how you’ll did on your list and what you’ve planned for the next months. Join Elisa and I and add your list! Sorry I am so late commenting, so much going on right now! I share with you the intense dislike for household chores of any sort. The decluttering helps keep things a bit tidier longer, but in the end, one has to clean ;-) I’m hoping my cleaning schedule will help… good luck finding a cleaning lady! Have a wonderful month, Tobia! Oh my goodness, I can’t believe I am going to see you in just a few days! Yay! I know it’s so surreal that we meet again. I feel like we’ve spend so much time together already but than it was only a day! And for being good – well let’s see you only live once … I can hardly contain all my excitement but no one really gets it only 4 more days! This month is going by too quickly! I know what you mean about cleaning. I HATE cleaning too, There are certain things I hate most, like sweeping, mopping, and vacuuming. ugh, maybe someday I will get cleaning help. I do LOVE the way things look when it’s all tidy. Best of luck for your goals as we finish off the month! I know its the worst, right? Thanks for reminding me to finish off ;-) still lots to catch up too.